Interviews are the stages of the recruiting system. They may differ in nature, however the objective of the interviews remain all the same. Interview types vary from face-to-face (in-person) interviews, panel interview, and group interview, to the electronic format i.e. telephone interview, etc. The first stage of the recruiting system starts with the applicants, who drop in their resume through different modes. The recruiting staff or the employer then views these resumes. Later the applicants are notified of their interviews. Large-scale industries’ recruiters prepare interview stages in qualifier format before face-to-face interviews. However, small-scale companies and organizations prefer direct interviewing that saves time and money. The chief motive of the final stage of the recruiting process is to deeply analyze and understand the background of the candidate. This helps in making a clear judgment of ability and suitability to the firm. At this point of the process, the interviewer needs to focus and dig in the necessary information. All the employers and interviewers will agree to the fact that interview question is the pivotal element of the process in the selection. Hence, it is very important to ask the correct question to determine the candidate’s ability. Questioning strategies include creating definite criteria. Laying down a criterion helps in forming appropriate questions. Moreover, it becomes easier to dig in the relevant and required information. Thus, let us look at the criterion that helps you in creating a frame for the perfect interview. Career steps of the candidate help the employer in understanding the level and experience of the employee. Asking questions that provide you more answer might help here. Here dig in the information about the career development of the candidate and you may be able to detect whether his or her experience and knowledge is required for the job available. What is the definition of an ideal interview candidate for you? You would say an ideal candidate is the one who not only prepares well but also does the necessary homework. What do you mean by necessary homework? Well, by homework I mean that the person must be well versed with the company’s background, visions, opportunities, etc. In this part of the questionnaire preparation, your questions must be able to reflect the homework skills of your candidate. Moreover, you will be able to understand the obstacles he or she might face on joining the firm. This will give you the clear idea whether the person in front of you is the ‘one’ for your organization. Imagine that you are an experienced candidate. You are excellent in your working field thus, you are offered a job. You start working with enthusiasm for the company’s betterment. You give your best to the job, however, no matter how much you give to the company, you do not get any credit for it. What will happen? Gradually you will lose the motivation to work and as a result, your working efficiency will decrease. Indirectly it will make you laid back towards your duties. As an employer, would you like this happening with your employee? Of course, no one would like it. Thus, your question should be based on the motivating factor of the candidate, work philosophy, team spirit, etc. These questions will give you an insight on the capabilities of the employee. If your questions revolve around these topics, you may get a clearer view of your potential employee. However, make sure that you give enough time to the candidate to speak. The more he speaks the more will you be able to evaluate him? Thus, you need to prepare the questions as well as your objective behind asking them so that the answers you receive are adequate for the job offer. Below there are few sample questions that might be helpful regardless of the nature of your firm. This is the most typical question and interviewers never forget to ask this question to the candidate. If you are a new recruiter then you might think that this is just another question, which gives the interviewee a chance to brag about himself (similar to what he has mentioned in the CV). Apparently, you are not correct (entirely). 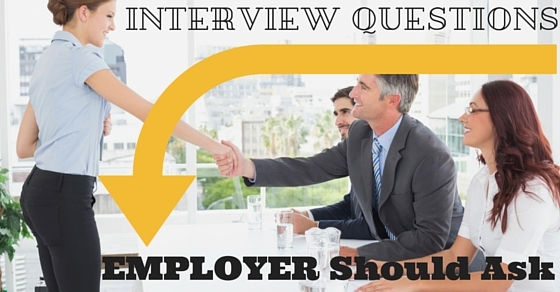 This typical open-ended question gives the opportunity to the interviewee to get comfortable with you. As a result, the interviewee is able to judge the confidence level and communication skills. Moreover, what is wrong with selling yourself as long as the bargain holds a connection with the reality? 2. How would your boss describe you? Less or no cooperation can lead to horrible results in the corporate sector. Thus, a healthy relationship between you and your employee matters a lot. A little bit of miscommunication, may result in great loss of the company? Hence, by asking this question you not only evaluate the past relationship of the employee but also try to dig in for his strength and weakness. The answer you interviewee may provide might not be enough to select him right away but it will give you a basic insight of the applicant. Moreover, a smart applicant never reveals too much of his shortcomings. 3. If I contact your last supervisor or boss for the area in which you need improvement, what will I get to hear? This question is like those repetitive questions in the IQ tests. They might have the same objective but unconsciously they make you reveal you are true self. Similarly, this question may prove to be confirming question. It might be similar to the question #2 however when you involve the boss for a reference, the interviewee is ought to talk honestly about his shortcomings. This is an indirect way to confirm whether the employee is honest or not. It is another point that the recruiter should consider before offering the job. 4. You resume highlights that you have worked with various bosses. Who was the best of his kind? Or (for first-time applicants) Who is an ideal boss for you? This question, when asked to a person who has worked at various places may give an insight of his work type, work culture, thoughts and his relationship with the supervisor. However, an experienced applicant knows how to make an impression with this question. When you ask this question to a fresh applicant, he or she is definitely going to put out all the expectations they have with you. This will indirectly answer you about their motivating factors. If their ideal boss is the one who gives a motivating speech every morning (wolf of the Wall Street) or the one who provides a bit of extra assistance when they require. 5. What role do you play in your team usually? How do your co-workers perceive your work? This question not just portrays the ability of the candidate but also shows his or her relationship with the colleagues. However, the question does not merely bring out the capability but also the self-sufficiency of the candidate. Moreover, it also underlines the ability of the applicant to work according to the direction. Very subtly, this question gives an insight of the personality and reliability of your future employee. 6. As a team leader how do engage your staff into giving their valuable input in important strategic decisions of the company? This question can help interviewing a candidate for the position of a manager. This refers to the skills of the person to manage and engage the staff. Moreover, it also shows the mentality of the person regarding the idea of team spirit. If a person can manage and engage the office crowd well, he or she is indeed a talented manager. Moreover, the managing style of a person is more than enough to understand the person. 7. Have you ever failed at making a deal? If yes then how did you mend it? (Or) What did you learn from it? Imagine you have worked all night long to make a presentation. It is the best thing you have ever created. However, at the last moment, your laptop is corrupted and the file disappears. How will you handle the situation? Well, your reaction in this situation shows your ability to handle pressure and last moment changes. Similarly, this question will let you judge your applicant whether he or she is capable of taking the workload or pressure. 8. What motivates you to strive for better performance? Some people are motivated by the increment while some are by the appreciation and recognition by the employer. Motivating factors vary greatly however, if the factors are available at your workplace then you have the right candidate at your place. Motivating factors help you in working better. As a result, the candidate will always have something as a reward standing at the end of the tunnel to encourage him or her. 9. Discuss the factors that trigger your frustration. How do you deal with it? If something motivates you, there is a possibility of things that frustrate and irritate you. These irritating factors tell more about the diplomacy and professionalism of the applicant. If the candidate comes up with irritation related to the co-workers or some minor office issues then the person is not that mature enough to handle your workplace. However, if the candidate discusses issues related to the budget system, time issues or the priority clashes then he or she if fit to run your business smoothly. 10. Which project you have worked in did you love the most? Why is it your favorite? Resumes are full self-selling. They have all the accomplishments, responsibility, capability, ability, etc. When you question your interviewer about this, their answer determines the passion they have for their work. If the accomplishments they have mentioned in the resume were a slight bit fake, you would know right away. Hence, this question will again be revealing question for you. If they are passionate, they will be able to give their best to your company. 11. If you are gifted with a past machine what changes would you like to make in your life? Past mistakes are the best way to learn. The experience is the thing that matters in running a business smoothly. Indirectly asking the person about decisions that turned out wrong is the best way to understand his or her experiences and knowledge of the subject. It is the platform for the candidate to share his experience and his ambition. Moreover, it gives them the opportunity to share the lesson he or she learned from the previous mistake. This question sets the perfect opportunity for the candidate to sell him or herself by highlighting the points that separate them from the rest. Uniqueness is the attribute of a successful personality. This question also helps you to identify the unique talent from the sea of resumes. An interviewer who is able to explain his uniqueness is the one who is capable of taking your business to new heights. This question reveals the ambition of the candidate. Moreover, this helps in understanding whether the opportunities available at your firm is fit for hiring this individual. If they fit with your firm then with their ambition they will surely develop your firm along with themselves. If the eyes of your candidate light up at the thought of the future then he or she is definitely the right candidate. 14. Do you have any questions you would like to ask? This is an ideal end to a long interview. Here, you give the candidate an opportunity to ask you the questions. This shows them that your company values the input of their employees. Moreover, it also shows them that you will always be there to assist them. If they do not have any questions for you, it means that they do not have the passion or interest you need in your candidate. Thus, question them in a way that it becomes easy for you to select the best candidate.